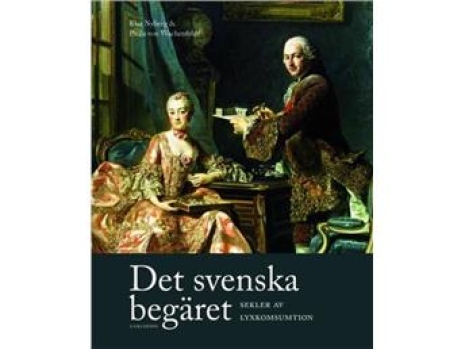 The anthology The Swedish Desire – Centuries of Luxury Consumption – is the first academic Swedish book on luxury history and development between the seventeenth and the first half of the twentieth century. The editors of the book are senior lecturer Paula von Wachenfeldt and Professor Klas Nyberg at the Centre for Fashion Studies, Stockholm University. There are few things that can create so much debate and resentment as the topic of luxury. As much as it creates well-being and comfort for its owner luxury can also be a needle in the eye of the viewer. And as much as it can be an aesthetic expression it remains a bitter reminder of social ills. As in most Western societies, Sweden has been an interesting arena for all kind of luxury parades and consumption and, not least, resistance. This book illustrates different historical examples of luxury use, human desire and bitterness. The Swedish Desire – Centuries of Luxury Consumption is published by Carlsson Bokförlag. Editors: Paula von Wachenfeldt and Klas Nyberg. Texts by Paula von Wachenfledt, Klas Nyberg, Marjatta Rahikainen, Kirsi Vainio-Korhonen, Håkan Jakobsson, Carolina Brown, Leif Runelfelt, Helena Kåberg, Louise Wallenberg and Ulrika Berglund. Published with support from Torsten Söderbergs Stiftelse and Familjen Erling-Perssons Stiftelse. Relive the book release here!